Last month, when hubby and I visited my son in Cape Town, we wanted to bring a little something back for our grandsons. As we strolled through the flea market on the Saturday morning, we spotted a stall that caught our attention. Gloop! The boys would love that sticky, gooey mess. We added our choices of color to the tubs of gel—blue for Phoenix and green for Liam, because that’s his favorite color he keeps reminding us. We also added glitter and stars to the mix. Gosh, they looked so pretty! This past Friday night I was babysitting the boys. To keep them busy, I pulled out the one tub of Gloop I had at my house. By now, the beautiful green had turned the color of dirty water. One lonely little star had made its way to the top of the gel. Soon the boys were squealing with delight as, to my horror, they pulled the sticky mess this way and that. Gel flew in all directions…onto the table and onto their clothes. Even the grapes got a dunking. Then came the time to clean up for dinner. Oh boy, I don’t know who had more Gloop on their hands and up their arms—the boys or me as I tried to de-sticky them and at the same time try my best to save as much of the Gloop as I could (yep, sometimes, although #proudlyScottish, I gotta get a tad annoyed at the Scottish blood that runs through my veins). The situation was frustrating and at the same time, funny. When I’d saved as much as I possibly could, we took turns at the basin washing off the rest. 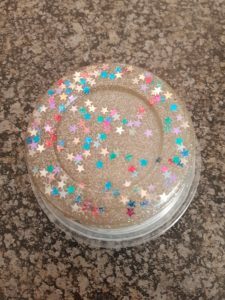 Soon the porcelain bowl sparkled with glitter and stars that couldn’t be recovered and quickly disappeared down the drain. Some relationships are like this pot of Gloop—the color fades and they’re just one sticky mess. And some are a sticky mess even when they’re bright and new. The one thing I loved about this gift that I sometimes regret having bought, is that when you dig to the bottom of the mess, the stars are there ready and waiting for someone to discover they still exist…that there’s still beauty in the mess. What romances have you read lately that have the hero and heroine constantly landing in sticky situations? Or where the beauty of their relationship or marriage has lost its lustre and color? Over to you ladies—let’s talk sticky mess books. 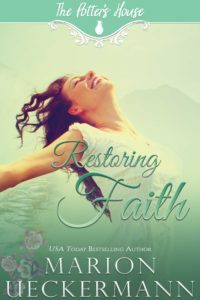 I’ll kick off the discussion by mentioning that my first Potter’s House book, Restoring Faith, has Charles and Faith Young in a marriage that has all but lost its shine, hence the tagline When love grows cold and vows forgotten, can faith be restored? If you haven’t read this story yet, you can get a sneak peak with my YouTube video below. Hi Marion, Gloop sounds like something my kids would love!! Both made slime at school and LOVED it. What a great analogy to relationships- thanks for sharing. I feel like it is too easy sometimes to only see the mess/yuck and give up, missing the stars on the bottom. They certainly would love Gloop :) Yes, sometimes people are so focused on the mess, they can’t see the beauty that’s still there to behold. Hi Marion! Love your analogy, plus the cultural note of being Scottish. Analogies and cultural notes makes your stories unique. Life and romance is messy. Life isn’t fair. As a German were cleanliness is next to Godliness, not fond of gloop or slime. Always interesting how culture and our upbringing influences the choices one makes. Best wishes and happy writing. Glad you enjoyed the blog, Renate. LOL, I’m not fond of slime either, but it did keep the boys entertained while I sorted out dinner :) A new hot, sad mess is in the making as I work on Recovering Hope. What a great post, Marion! 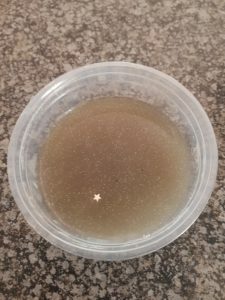 I especially love the way you needed to save all the gloop you could while still being frustrated at the mess it caused….that can also be part of your relationship analogy….. trying to hold on to as much of the mess as we can no matter how sticky it is….. Loved the sticky mess stuff. Sounds like something my son would love.. in a few years. Sometimes we stay in a sticky mess of a relationship,especially women who want to fix everything. Loved the sticky mess stuff. Messy means fun to kids. Such a pity messy doesn’t remain fun once we’re grown up. Great analogy, Marion! 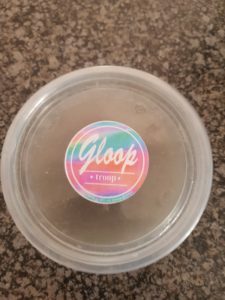 Real life and real relationships, even the best ones, can be very like a tub of Gloop. We just need to look for the stars, not the mess. Thanks for the reminder! I have never read such a beautiful analogy in my life, Marion. Yes there is still beauty in the mess and it reminds me of this proverb: Everyday might not be good, but there is always something good everyday. You’re always amazing me with your beautiful writing style, Marion. What makes us unhappy is that we always see the past more beautiful than it was, the present more worse than it’s, and future more complicated than it’ll be. Wishing you the best in your writing, my friend. I bet your grandson’s parents just loved you for this. LOL, well, I haven’t had any complaints yet, Shannon. However, only one tub of Gloop made it to their house. The other is still at my home.